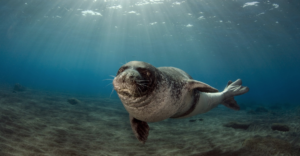 The Mediterranean monk seal, Monachus monachus, is one of the most threatened species of marine mammals in the world, according to the red list published by the International Union for the Conservation of Nature (IUCN). Less than a century ago, the entire Mediterranean Sea was occupied by large populations of seals, from Spain to Israel, from Italy to Libya. The Octopus Foundation decided as early as 2014 to observe these animals during field missions, in order to assess their presence. In early 2018, the specific project to help this endangered species was launched. Firstly, the Foundation will collect scientific data ; this support will be done in coordination with the IUCN, which will bring the scientists in charge of this subject together with the people who work in areas still visited by monk seals. A direct support will be granted to Giorgos Lilas and Cédric Georges. They both own a diving center, the former on the island of Ithaca and the latter on Kefalonia. George (who has graduated as a marine biologist) and Lilas have always made a point of studying and protecting the many species they come in contact with as they guide their clients in the area. They will be tasked with gathering precious data in order to better understand the monk seal. The collected information will then be rigorously studied by scientists that are currently working on the project. During this year’s filed mission, scheduled to take place between the 27th of May and the 7th of June, the members of the Octopus Foundation will deploy and test cutting-edge technology designed to generalise the observation of monk seals. These devices, once validated, could one day be deployed to the entire Mediterranean Sea, which will dramatically help the understanding of the species. Various media (photos, videos, drawings, press articles) will also be published. They are designed to raise awareness on the monk seal’s situation in the Mediterranean.